I naturally assumed that this sort of sequence would be difficult to do, but once I wrote the script, I realized that it should naturally be hectic to the point that the only parts I would show would be relatively easy to draw. Specifically, it meant that Ashley going from standing to being held naturally lacked a smooth transition, and I would have had a very difficult time drawing one. 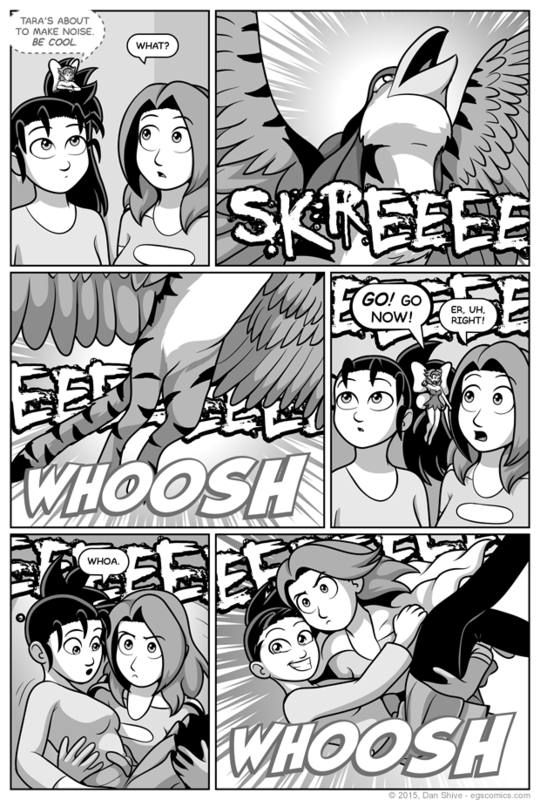 I originally only had the "skree" in one panel, but the whole point of Tara's loud departure was to distract people from Elliot and Ashley's departure, so it wound up continuing. It makes the visuals a bit more hectic than I'd planned, but it fits the hasty retreat, so I'm happy with it. As for why Tara is cool with being the distraction, she's not the one who needs to transform back into her secret identity, and it's not like there's anyone there who is going to try and stop her from leaving. Probably not, but I've gotta keep things suspensful, darn it. Besides, she's kinda sorta in Elliot's debt given her previous actions. This is the least she can do. EDIT: I made this preview image for this comic, and I figured this is a rare case of it being worth including it in the commentary as it's a zoom in of panel one.